You always knew that Mama wanted you to take care of yourself and eat well. 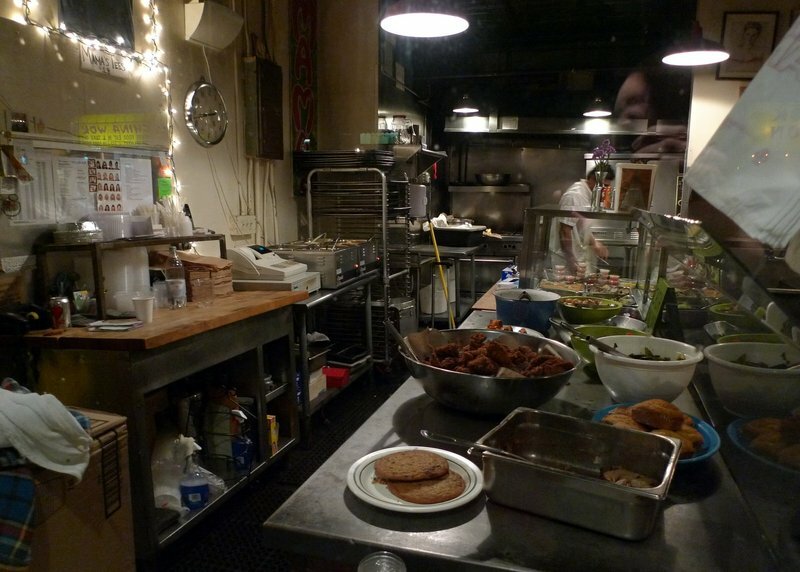 At this hole-in-the-wall restaurant in the East Village of Manhattan, you can get a healthy serving of good food prepared just the way your mother would want it to be. This may sound like an advertising claim but it is actually an accurate description of what you find at Mama’s Food Shop. Located on 3rd Street between Avenues A and B, Mama’s was a recommendation from our friend Biing during our visit to New York last summer. Biing’s list of recommendations was too long to complete on our last visit, so we used this trip to check a few more items off it. Arriving to our midtown hotel, the Affinia Dumont on 34th Street, on a rainy and cool Monday evening, we needed somewhere easy for dinner but didn’t want to take a chance on the unknown restaurants in the Murray Hill neighborhood that surrounds the hotel. We hopped a taxi down to Alphabet City. 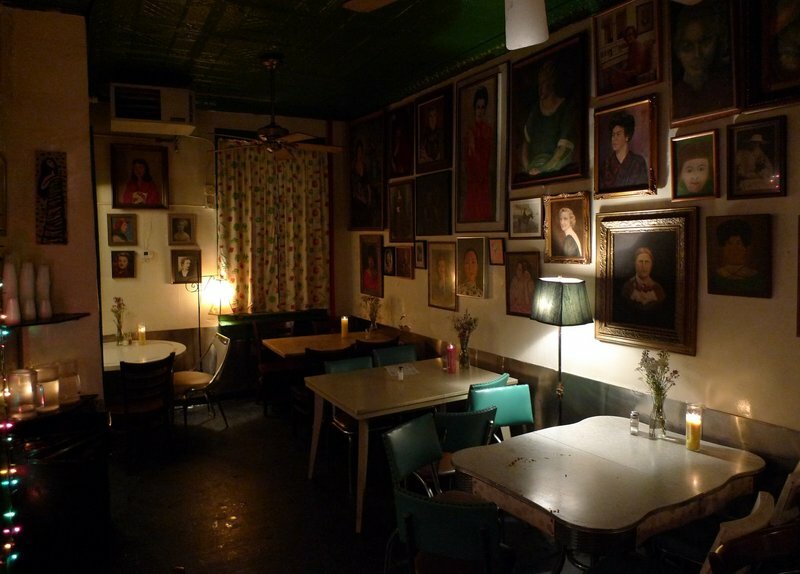 The funky decor is shabby-chic with Christmas lights on one wall and portraits of mothers on the other. The floor is wooden, the seating eclectic and unassigned (table sharing is common), and the smell of frying chicken permeates the space and your clothing. The efficient kitchen turns out five mains each at $12 a plate with one side: fried chicken, roast chicken, roast pork shoulder, meatloaf, and pan-seared tilapia. The sides include simple yet satisfying dishes such as mac and cheese, roasted beets, broccoli and garlic, mashed potatoes, and cole slaw. Additional sides are $1 for an extra serving or you can buy them to-go in half-pint and pint quantities. So a main with two sides works out to $13 – not overly expensive but not quite a bargain, either, until you consider the quantity and quality. 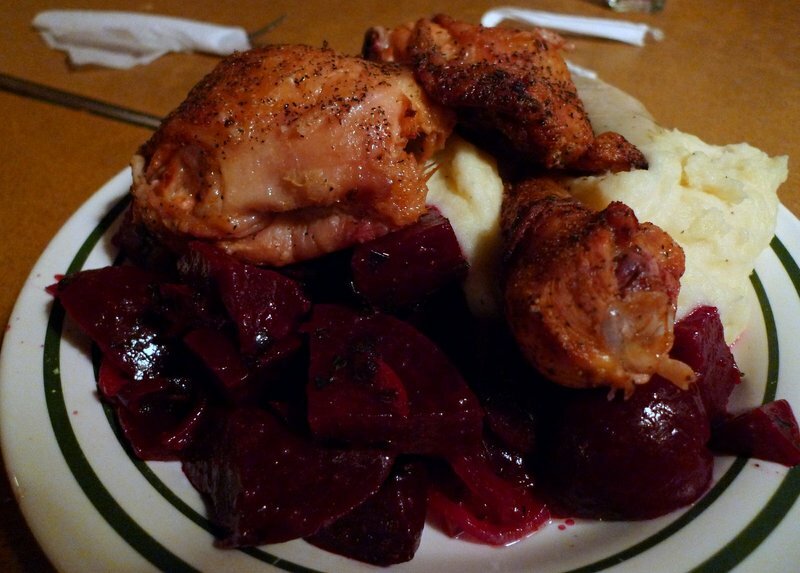 My plate of roasted chicken with mashed potatoes and beets was huge – three pieces of chicken and a week’s worth of beets. 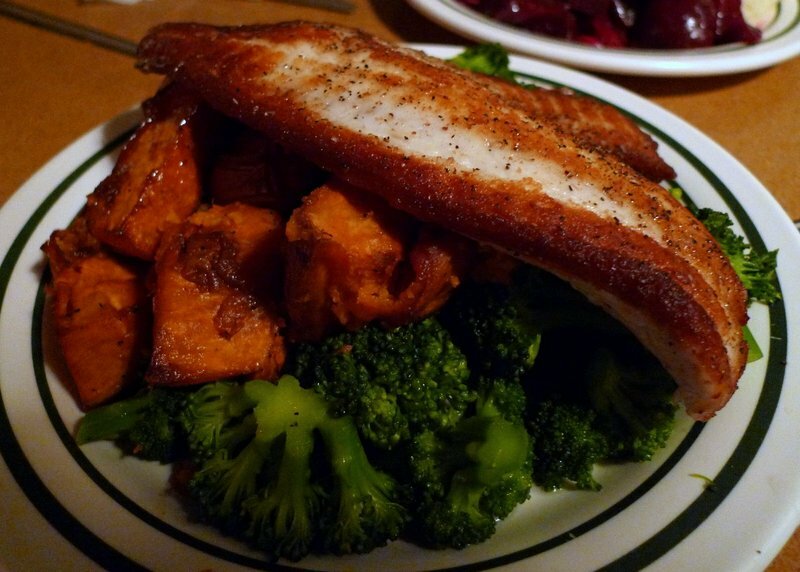 Tawn’s tilapia (they also do a veggie plate composed of three sides for $11) included two large fillets to go with the roasted sweet potatoes and broccoli. Flavors were consistently good although the sides were not piping hot – possibly due to my picture taking. 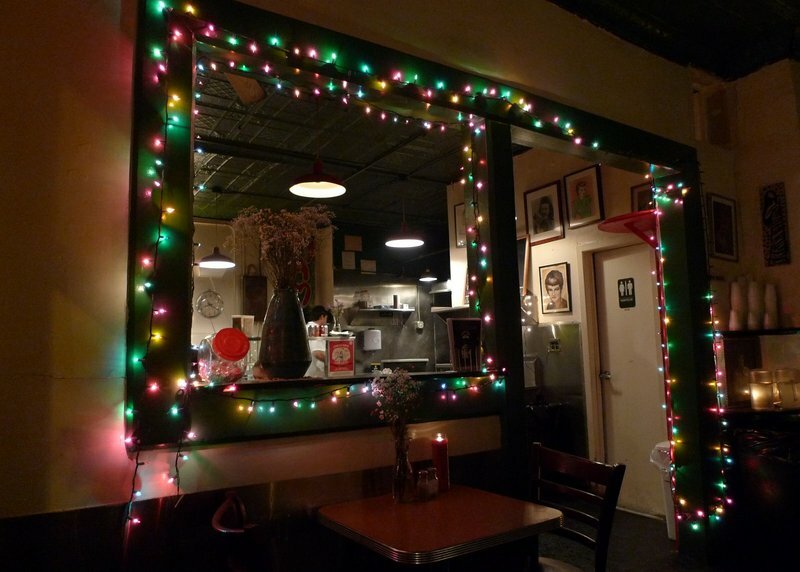 All in all, Mama’s does right by their customers, including a 10% dinner discount for students. The food is simple, healthy, and generous. Next time I think we’ll skip on the extra sides and maybe even share a plate. This entry was posted in Uncategorized and tagged Alphabet City, Dining, East Village, food, Mama's, New York City by christao408. Bookmark the permalink. Coolness, I’ll try to remember this place the next time I visit NY. The Tilapia, and the beets on your plate look so good. “A week’s worth of beets.” oh I love that line!Those are huge servings. Were you able to finish everything? I bet Tawn was still hungry afterwards. @ElusiveWords – Well, that was the day we arrived and we were stuck in O’Hare Airport for several hours of delays, so we were quite hungry. In the end, I think we finished nearly everything. Since it was mostly veggies, it was pretty healthy… I hope! @CurryPuffy – @ZSA_MD – I heart beets. @Wangium – So it isn’t just me, then? The prices are a little high, right? I guess NYC is quite expensive so maybe that justifies it. @murisopsis – Broccoli poem! Can’t wait. Can you do a beet poem afterwards? @Roadlesstaken – I’m think I’m going to do one of the Google Map city listings like I’ve done for KL, Tokyo, and some of the other places I’ve visited. Wow that’s really reasonable. Tasted good? I think that sounds amazingly reasonable. You don’t find too many places like that in big cities! @yang1815 – Very tasty in a basic, all-American way. Veggies weren’t overcooked, which was a nice change of pace from, say, Omaha style. =D@TheCheshireGrins – I’m glad to hear you think so. It seemed like it might be a little pricey but my perspective on US prices is a bit off whack. @murisopsis – The beet poets were very talented. Having grown up in the SF area I always enjoyed going to North Beach and the City Lights Bookstore where the beet poets and other vegetables hung out. That looks like a nice cosy place. I see they found an alternative to constantly redecorating ! Lol Gee, those portions = 2 meals for me ! Wow, talk about eclectic!BTW, I think it’s “Tilapia”. @arenadi – Indeed it is. Correction made. Thanks for catching it. @Keeko1 – Glad you liked it. @Chatamanda – Those portions could feed a village! @Rm2046 – You one of those long-haired hippies!? Oh, wait… not long-haired, that’s for sure. =D@brooklyn2028 – Thankfully, the pictures’ eyes don’t move!